Access all Eagle, Idaho homes for sale and real estate here. Properties in Eagle are updated daily from the MLS, so be sure to return here for the newest listings for sale in Eagle, Idaho. 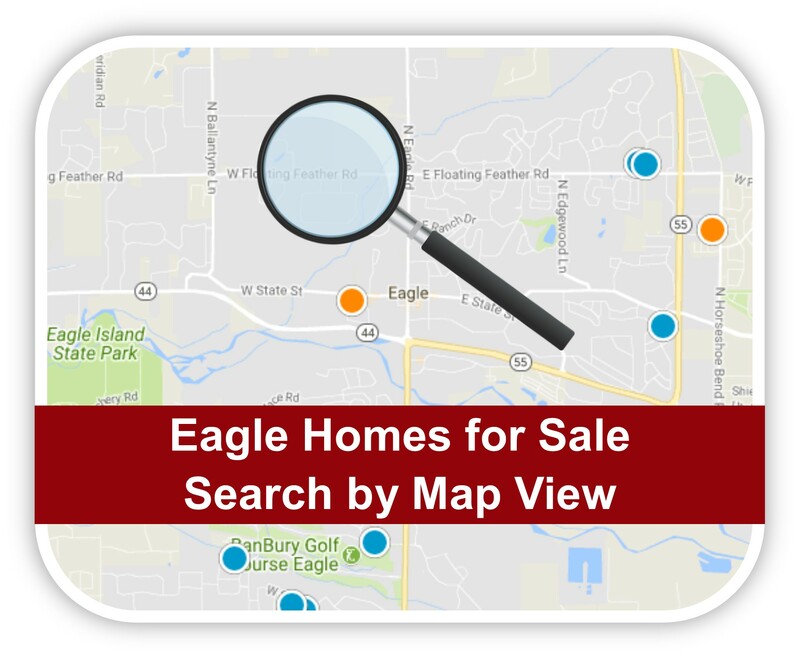 Click Here to View the Newest Homes for Sale in Eagle! Living in Eagle, Idaho is perfect for those who seek a life of elegance and peace with easy accessibility to countless outdoor activities. Nestled between the Boise River, and the beautiful Boise Foothills, Eagle is in an ideal location and locals view it as the most affluent part of the Valley. Originally a gold mining town in the late 1800’s, Eagle today is dynamic with it’s rural roots and modern flavor. Whether you are looking for a place to retire in leisure, or a safe and quiet place to raise a family, Eagle is an amazing city to call home. Eagle is one of the fastest growing cities in the Treasure Valley, as more people discover how comfortable and relaxing life can be in it’s esteemed communities. Located west of Boise, and north of Meridian, at the northernmost edge of the Treasure Valley. Eagle is currently the 13th largest city in the state of Idaho, with roughly 24,000 residents. However, the small size of Eagle does not prevent it from having some of the most upscale homes in the whole Valley. When compared to the rest of the Treasure Valley, Eagle attracts affluent residents which is reflected in the town’s median income, average home price, and surrounding private schools. The cost of living here may be higher than the rest of the Valley, but that cost does afford larger luxury homes, equestrian properties and perfectly manicured acreage. Eagle is home to wineries, golf courses, and a local State Park that residents often frequent, Eagle Island State Park. Eagle Island is located on the Boise River, and is home to 5 miles of trails to hike or ride horses. They also offer swimming beaches and a water slide, picnic areas, disc golf, zip lines, and in the winter time a snow hill for tubing, skiing and snowboarding. It is a short drive from anywhere in Eagle, and offers fun and opportunity to breathe and unwind from the stresses of life and work. The Valley’s main thoroughfare, Eagle Road, is lined with some of the best restaurants and shopping Idaho has to offer. It connects Eagle to the city of Meridian and runs nearly to Kuna in the southernmost part of the Valley. Another close Highway just outside of Eagle is ID-55 which leads north into the mountains. One of the most popular towns that tourists and locals alike enjoy is McCall, Idaho. The city of McCall is a two hour drive from Eagle, and is located on the shores of Payette Lake. Here, people can go fishing, swimming, boating, and camping at one of the many nearby national forests and parks. There are even large enough boat docks to accommodate sailboats for those who need to fill that sailing itch in Idaho. On the way to McCall, there is Tamarack Ski Resort, which is one of the highest rated ski resorts in all of Idaho. During winter, the snowy, winter storms provide perfect powder to ski and snowboard. Tamarack is still a beautiful place during the summer, where you can escape the Valley’s heat and take in all of the natural splendor that Idaho has to offer. In Eagle, all of your outdoor needs are just a hop, skip and a jump away. Being located in the Treasure Valley, Eagle experiences mild weather year round. During the summer and winter months, residents do occasionally feel both extremes. Summer highs can reach the 100s, while winter lows can dip into the single digits. However, high averages for the summer hover around 80 degrees, and the average lows for winter are around 25 degrees. There is some winter snowfall, which varies each year and tends to be mild compared to our northern neighboring cities. About six inches of snow at one time is common, but typically melts away in a few short days. Eagle also enjoys over 200 days of nice, sunny weather throughout the year making this city an ideal place for those who relish outdoor activities and hobbies for the whole family to experience. Employment in Eagle includes various industries and job types, and the current growth will demand more jobs for each of these fields. The tech boom in Boise has had rippling effects into Eagle, with TSheets being the pinnacle of the tech industry. TSheets has been named one of the best places to work for for three straight years, and was just bought by tech giant Intuit in late 2017, after a five year partnership with the software company. TSheets is located off of Eagle Road and Chinden Blvd. Outside of the budding tech industry, there are jobs in nearly every industry in, and around Eagle. The commute for residents is a brief 20 minutes or so on average. With the wealth that the city of Eagle has, residents do typically have a higher median household income when compared to the rest of the Treasure Valley, and the country as a whole. The average household income for Eagle homes is over $80,000 per year. Regardless of your work experience or career field, there is ample job opportunities for everyone who wants to call Eagle, Idaho home.